Dürr Ecoclean uses Virtual Reality in training its global service staff to carry out maintenance support on its complex manipulators. 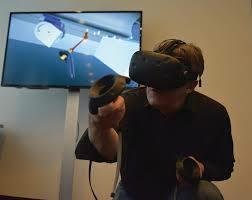 The rendering and simultaneous perception of reality in Virtual Reality – and its physical properties – in a real-time computer generated, interactive virtual environment also offers plenty of opportunities in industry. Dürr Ecoclean, as a producer of forward-looking machinery, systems and services for industrial part cleaning and surface treatment in the automotive manufacturing and supplier industries in addition to a host of other industrial market sectors, relies on virtual space in training its service technicians all around the globe. More specifically, this first VR application was developed by Tema Technology Marketing AG to conduct maintenance training on the Scara manipulator developed by Dürr Ecoclean Monschau for its EcoCFlex 3 flexible cleaning cell. In this scenario, the instructor and the trainee may be located thousands of kilometers apart. For a realistic rendering of all maintenance operations and workflows, a VR model of the manipulator was created from CAD data. This model can be moved in all directions of freedom via slider bars. Every bolt can be slackened and re-tightened in this manner, yet the individual jobs are logically structured and interdependent. For instance, in performing an oil change in the virtual system, the transmission cover can only be re-closed after oil has actually been added. This approach ensures that the various steps will be trained in their correct and full sequence, thus becoming “ingrained”. In order to achieve this, each service operative can move freely on a defined surface area in virtual space, e.g., by walking around the manipulator. 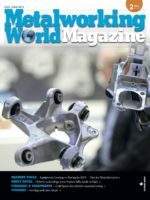 “This development is an important step in ensuring that our global service technicians will be perfectly familiar with their tasks and can provide excellent support to our customers in minimum time”, comments Michael Förster, Chief Executive Officer at Dürr Ecoclean, in explaining his company’s decision in favour of the use of VR. Previous Post Meusburger presents new clamping devices for ergonomic work during polishing Next Post New Bihler 4SLIDE-NC Automation supports re-shoring and near-shoring in U.S.